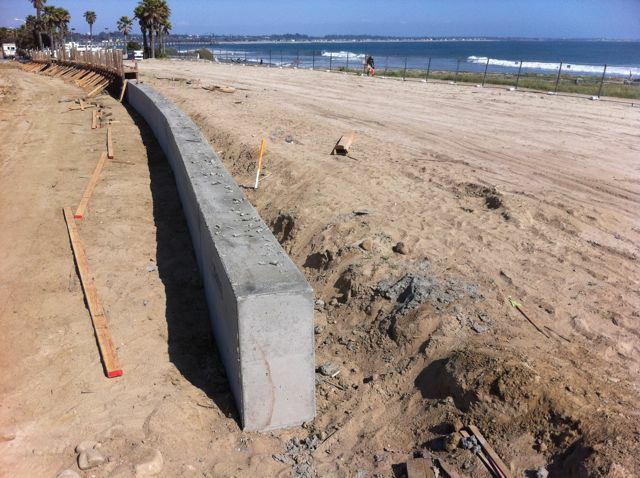 This low wall will mark the boundary between the restored beach and the new bike path. The 'line in the sand' represents approximately 65 feet of shoreline retreat, intended to make room for sand dunes and the buried cobble berm. The new wall and concrete bike path are intended to mimic the wall along the promenade beach in front of the City's beach parking lot. Coastal engineering analysis calculated the 'wave runup line,' represented by the dotted line in the picture below. This was a calculated estimate of the landward limit of wave runup after an extreme event (approximate a 50-year recurrence frequency) and approximately 50 years of shoreline recession due to sediment deficit and sea level rise. In this manner the bike path is estimated to be set back far enough to withstand future damages for the next 50 years. For all this to be truly effective, dunes will need to be constructed and vegetated within the retreat zone. Unfortunately this component of the project was not included in Phase I. Construction of these protective dunes will first require importing additional sand - the planned height of these dunes is approximately 3 feet. 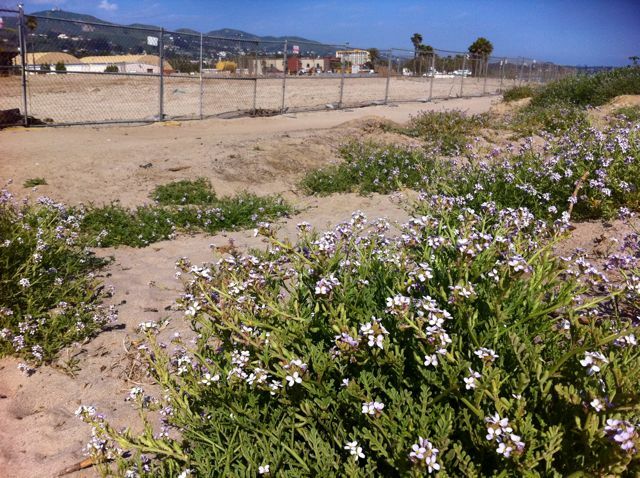 The small dune area at Surfers Point today is the result of a Surfrider Foundation project dating back to 1992. Following construction of the parking lot in 1989, visitors trampled the dune vegetation and the sand blew away. Surfrider volunteers received a small grant to construct the wooden fencing that served to guide foot traffic through a fixed pathway from the parking lot to the beach. This fence was maintained for a decade by a dedicated Surfrider volunteer, and over the years the dunes slowly rebuilt themselves as native vegetation was allowed to naturally re-established itself. The flowering dunes seen today are an indication that this habitat is ready to expand. Windblown seeds will spread these plants, which will in turn trap windblown sand and build dunes. The dune restoration plan, if funded and constructed, will 'jump-start' this process, and in a short time we will enjoy a restored natural beach at the mouth of the Ventura River.